At 10 a.m. on Tuesday, women across Israel walked out of their workplaces for 24 minutes, one minute for each woman killed so far in 2018. That statistic, a rise over the reported 17 killed in 2017, was the galvanizing factor for what protesters are calling an “unprecedented” show of female power in Israel as women protest what they say is the government’s lack of response to violence against women. A few hundred women and men had gathered for a small protest timed with the walkout. Many wore black in mourning of the 24 women killed in 2018. According to reports, several private companies supported the strike, allowing employees to leave work without being penalized. Labor unions also backed the strike. Early news reports said that thousands of women and men participated across the country. On the strike’s Facebook page, 13,000 people RSVPed that they were participating. “I came because change needs to happen and someone needs to push for it to happen,” she said. Two of the 24 women were young girls killed in the last week: Yara Ayoub, 16, and Silvana Tsegai, 12. According to the Facebook page of the strike, a coordinated effort by several activist groups and organizations, the point of the protest is twofold: one, to raise attention to what the organizers call an “emergency” of violence against women, and two, to pressure the government to fund a program to address the violence. The government approved the program last year, promising 250 million shekels, or roughly $67 million, but has yet to deliver the funds, according to Haaretz. If funded, the activists said on Facebook that the program will focus on rehabilitation for victims and perpetrators, education, and an overhaul of police policies in addressing domestic violence. Tuesday’s walkout was preceded by an act of civil disobedience on Sunday night when activist group Lotem filled fountains in Tel Aviv, Haifa, and Jerusalem with red paint to symbolize the blood of women killed. In Tel Aviv’s Habima Square, dozens of women’s shoes were painted red and arranged in a grid, an homage to the work of Mexican feminist artist Elina Chauvet. She said that the walkout was sparked by violence against women, but it reflects broader frustrations about the status of women in Israel, and the way that women’s interests are sidelined because of pressure from the ultra-Orthodox. In late November, Haaretz reported that the Council for Higher Education approved gender segregation at Israeli universities in order to increase enrolment of ultra-Orthodox men. Tzipi Livni, the head of the opposition, was also there. “It is such a moving and touching day because women decided to do something about our future,” she told the Forward. The actions are set to culminate Tuesday evening in a major demonstration in Tel Aviv’s Rabin Square. One of Tuesday’s protesters, Bernadette Bouwer, said that she showed up in part for her 1.5-year-old daughter, Lotus, who accompanied Bouwer to the protest in a baby carrier. “She’s going to live here and experience the same thing if we are not going to stop it now,” Bouwer said. 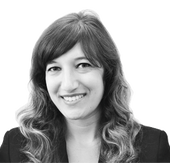 Naomi Zeveloff is the Forward’s former Middle East correspondent and a freelancer based in Jaffa. This story "Women Strike In Israel To Fight Violence Against Women" was written by Naomi Zeveloff.